Cognition has been variously defined as the mental action or process of acquiring knowledge and understanding through thought, experience, and the senses. It's basically what the brain does when you peel away all those easily definable actions such as appreciating sensation and motor output and vision. It is what the processing that the brain does between assessing and integrating sensory input and the defining a resultant effector output. Like any computer it requires memory and appropriate processing of input to generate output. Poor cognition will prevent you playing chess well but can also prevent you being able to care for yourself or to walk or talk and interact with others. Cognitive impairment is common following stroke. It can significantly affect care and quality of life. There is a high risk of developing dementia within the first year of stroke. Screening and assessment are needed. There are various neuropsychological assessments which can evaluate cognition following stroke. Stroke is often seen in older patients there may already be a baseline cognitive issue. 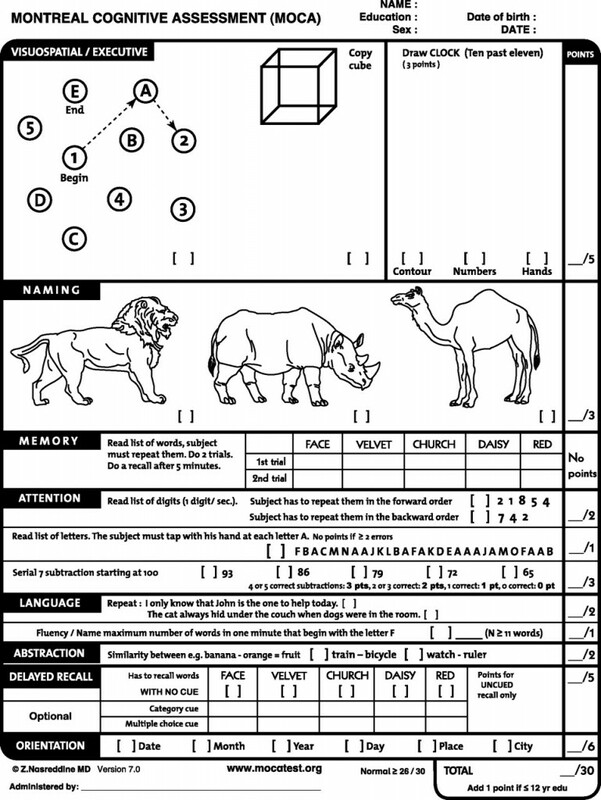 It is important that patients have cognitive assessment. There are a variety of different tests but many of these depend on engagement and patients are often unable to complete tests. Cognitive impairments can limit and reduce the success of rehabilitation outcomes and disease prognosis. Persisting defects can cause an inability to work and to take care of one's self and will increase care needs. They can create issues around risk and safety and can complicate discharge planning. Cognitive defects can be seen in patients with additional visual, motor and sensory impairments as well as apraxias and language issues. Stroke affects the cognitive domain, which includes attention, memory, language, and orientation. Affected domains most affected are attention and executive functions. Memory impairment is often prominent. Confusion: not orientated in place or time or person. Bizarre behaviours or words or statements. Can easily be confused with dysphasia. Memory: inability to learn and recall new information or remember and retrieve long term memory. May be subtle but can affect all aspects of daily living. Can be addressed by establishing a standard daily routine, keeping frequently used items in a designated place, and using a notebook for important information and by supervision if needed. Anosognosia: failure to recognise own deficits - a lack of insight into their impairment. Will believe they can walk and deny any deficit which leads to falls. Seen classically with right hemispheric strokes. Prosopagnosia, also known as "face blindness", is the inability to recognise faces. Lesion is in the occipito-temporal lobes and fusiform gyrus which activates specifically in response to faces. The inferior occipital areas are mainly involved in the early stages of face perception and the anterior temporal structures integrate specific information about the face, voice, and name of a familiar person. Ischaemic stroke is a significant risk factor for vascular cognitive impairment and vascular dementia. Studies have shown that in patients with ischaemic strokes that enlarged perivascular spaces are cross-sectionally associated with age, hypertension, and white matter hyperintensities and suggest that enlarged perivascular spaces in the basal ganglia are associated with cognitive impairment after one year. Assessment of cognition involves a full assessment of possible defects. These will often become apparent in the first few days after stroke and can be detected by medical and nursing staff as well as therapists who will focus on those which will impair functionality. Cognition and the ability to simply take in and process information will also be impaired by tiredness, pain or depression can all affect your ability to take information in and remain focused. The key constituent in the syndrome, however, is visual disorientation. Prosopagnosia, also called face blindness, is a cognitive disorder of face perception in which the ability to recognize familiar faces, including one's own face (self-recognition), is impaired, while other aspects of visual processing (e.g., object discrimination) and intellectual functioning (e.g., decision-making) remain intact. Anton–Babinski syndrome, also known as visual anosognosia, is a rare symptom of brain damage occurring in the occipital lobe. Those who have it are cortically blind, but affirm, often quite adamantly and in the face of clear evidence of their blindness such as walking into objects, that they are capable of seeing. This increases the risks of harm and injury and patients need close supervision. 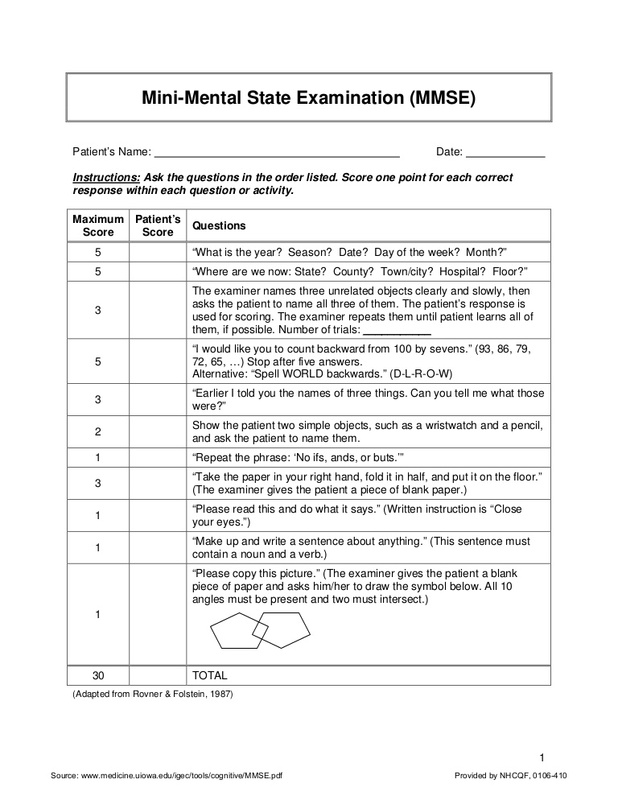 Folstein's mini-mental state examination (MMSE): Cognitive impairment after stroke has been defined as a mini mental state examination score of less than 26, recorded at one-year post stroke. The MMSE should be used as a screening device for cognitive impairment in which a low score indicates the need for further evaluation. It should not serve as the sole criterion for diagnosing dementia or to differentiate between various forms of dementia. The MMSE scores may be used to classify the severity of cognitive impairment or to document serial change in dementia patients. The test assumes fluency in English. A lower score may be seen in those with low educational attainment. It also assumes that patients are doing their best, are not fatigued and low mood can affect it and so it may needed to be repeated at intervals.